No collection of Alty Legends would be complete without the inclusion of 'Cote, a man who eats, drinks, breathes and lives the club and someone who is respected throughout the game and will forever be associated with the name of Altrincham Football Club. Graham started out as a 16 year-old with the Altrincham youth team and went on to make his first team debut as a 17 year-old the following season in a home 4-1 win against Chorley. So started a life-long love affair with the Robins, a career which has seen him fill the role of player, club captain, coach, assistant manager, secretary and now manager. As a player he was without peer, he showed vision (remember the goals against Everton and Spurs?) and more importantly the ability to find the gaps and produce the killer ball. He always appeared to have time on the ball. His dead ball skills were also legendary throughout the Non League game andnot unknown at higher levels. His total of appearances and goals ranks him high in either category of all time Altrincham players and during his playing career he won just about every trophy available to him, including two Alliance titles in 79/80 & 80/81, an Alliance league cup winner's medal in 80/81, 2 NWFL medals in 74/75 & 72/73, an FA Trophy winner’s medal in 77/78 and a finalist's medal in 81/82, an NPL runners up medal in 78/79, and a Cheshire Senior Cup winner's medal in 1985. Altogether he played 14 seasons for Altrincham, except for a short spell at Northwich when Les Rigby was manager. After a final playing season at Witton Albion (when he was released by John King) he quit playing at the age of 31 and moved seamlessly into management as number 2 to John King, initially at Runcorn and then back to Moss Lane. Graham then moved with John to Barrow and eventually took on his first manager’s job at Barrow when King left to join Bury. This was followed by a short spell as manager at Winsford before teaming up again with John King back at Moss Lane. On John King’s resignation in March 1998 Graham remained as secretary before being asked to assist with coaching the side that won the UniBond Premier League in 1998/99. In 2002 he was made a Freeman of the Borough of Altrincham for his services to the town and in late 2002 he was appointed Manager, a job he combines with his role as Secretary. 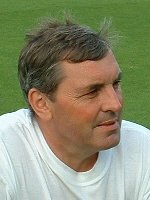 Ian Morris started his senior career as an amateur with Bolton Wanderers before signing professional terms with Stockport County in March 1968 and played 1+1 games. He left at the end of the season and joined Altrincham. Ian, an accountant by training, then spent the next decade playing for Altrincham and archrivals Macclesfield, playing a couple of spells for each club. Never a prolific scorer, he was however a very quick winger who delivered telling, accurate crosses for the strikers to feed off. Ian was once timed over 80 yards at 9.6 seconds and still looked very sharp at Graham Heathcote's testimonial match last season! He joined Altrincham towards the end of the 68/69 season making his debut in the 6-1 win over Goole and scoring twice in the 8-1 win over Northwich. He stayed at Moss Lane till the end of the following season before joining Macclesfield. In that first spell he won a Northwest Floodlit League winner's medal, followed by a NPL cup winner's medal and a Cheshire Senior Cup loser's medal the next season. He stayed at Macclesfleld for 4 seasons before returning to Altrincham for the 1974/75 season. and the start of the following season before the lure of the Moss Rose took him back to South Cheshire. This time Ian didn’t stay away long and was back for the start of the following season to join Tony Sanders's side. He was part of the side that made the FA Trophy semi-finals and a year later was part of the side that lifted the Trophy at Wembley after beating Leatherhead 3-1. This was the peak of his Altrincham career. The following season the arrival of Barry Howard meant that Ian was allowed to leave and joined Witton Albion. Johnny Worth was a typical bustling centre-forward and ‘character' who, it is said, would run through brick walls to chase a ball. He was tough but also not without skill and when fit was the perfect foil to the legendary Swindells. Johnny had two spells at Moss Lane, the first during 1963/64, when he joined from Rusholme of the Lancashire and Cheshire League. Although doing reasonably well, (scoring on his debut against Chester Reserves and scoring 8 goals in 13 appearances), he was allowed to join Hyde United, where he spent the next two and a half seasons before Freddie Pye brought him back to Moss Lane, when Len White broke his collar bone, for his second and more permanent spell at Moss Lane. His first season was his most productive, scoring 34 goals playing alongside Jackie Swindells and, indeed, he scored on his second debut (against Stockport Reserves) and also scored hat-tricks against Witton and Stalybridge and four against Frickley away, as Altrincham won the Cheshire County League and Cheshire Senior Cup. Unfortunately, a persistent knee injury dogged him throughout his career, forcing him to miss the majority of the 68/69 season. He was back for the 69/70 season and scored 27 goals, including a hat-trick in a 4-a win over his old club Hyde United as he added an NPL Cup winner's medal and a CSC finalist's medal to his collection. His last seasons brought diminishing returns on the goal front (scoring 19 goals, including a hat-trick against Great Harwood in the NWFL in 70/71 and only 8 goals in 71/72) but he picked up a NWFL winner's medal in 70/71. At the end of the 71/72 season he was allowed to move to Runcorn and, finally, Mossley before retiring from the game.